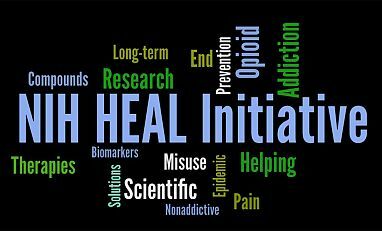 In 2017, there were 3,245 overdose deaths involving opioids in Florida—a rate of 16.3 deaths per 100,000 persons, compared to the national rate of 14.6 deaths per 100,000 persons. 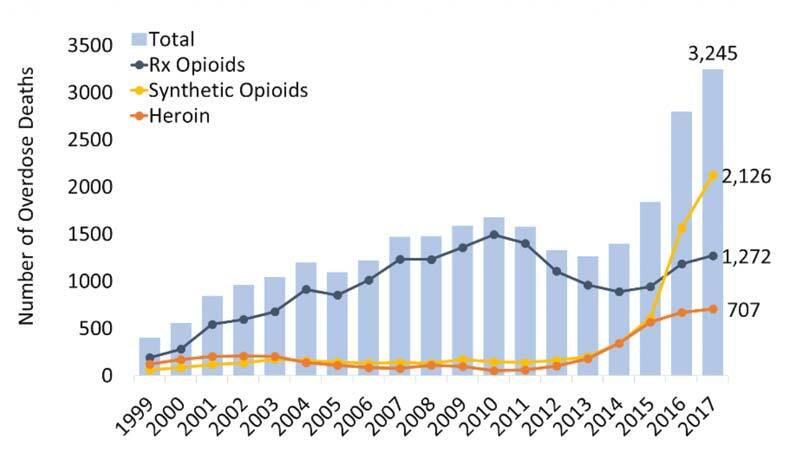 The greatest increase in opioid deaths was seen in cases involving synthetic opioids (mainly fentanyl): a rise from 162 deaths in 2012 to 2,126 in 2017. Deaths involving heroin also increased in the same 5-year period: from 101 to 707 deaths. There were 1,272 deaths involving prescription opioids in 2017, an increase from 889 in 2014 (Figure 1). Figure 1. Number of overdose deaths involving opioids in the Florida, by opioid category. Source: CDC WONDER. In 2017, Florida providers wrote 60.9 opioid prescriptions for every 100 persons (Figure 2), compared to the average U.S. rate of 58.7 prescriptions. This is the lowest rate since 2006 when this data became available (CDC). The rate of overdose deaths involving opioid prescriptions rose significantly from 1999 through 2010. From 2010 through 2015 the rate declined by half from 8.2 to 4.6 deaths per 100,000 persons. Since then, the rate has risen to 6.0 deaths per 100,000 persons in 2017. Figure 2. 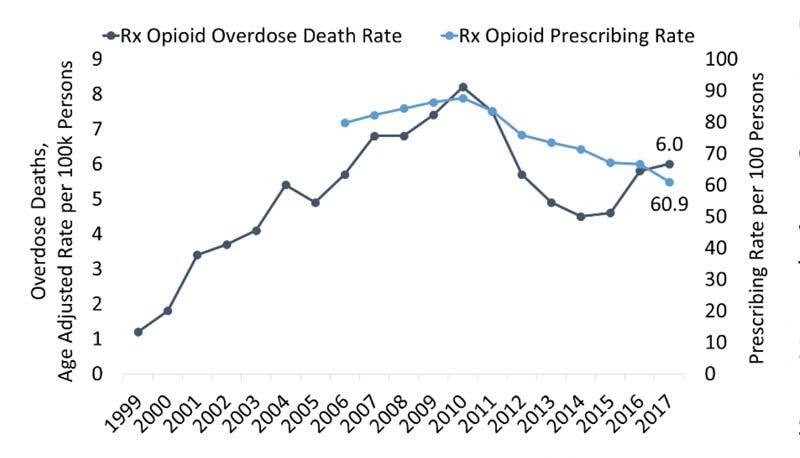 Florida rate of overdose deaths involving prescriptions opioids and the opioid prescribing rate. Source: CDC and CDC WONDER. NAS or neonatal opioid withdrawal syndrome (NOWS) may occur when a pregnant woman uses drugs such as opioids during pregnancy. A recent national study showed a fivefold increase in the incidence of NAS/NOWS between 2004 and 2014, from 1.5 cases per 1,000 hospital births to 8.0 cases per 1,000 hospital births. That is one baby born with NAS/NOWS every 15 minutes in the United States. 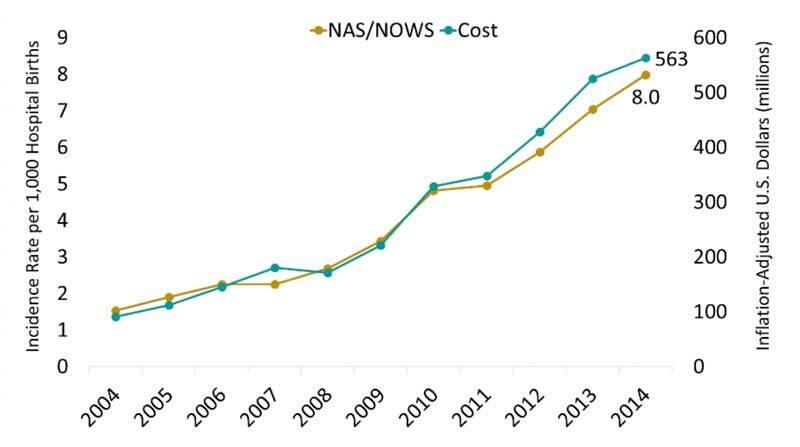 During the same period, hospital costs for NAS/NOW births increased from $91 million to $563 million, after adjusting for inflation (Figure 3). Figure 4. Florida: Estimated percent of male vs. female with new HIV diagnoses, by transmission category, 2016. Source: CDC and www.AIDSVU.org. State Incidence: Of the new HIV cases in 2016, 4,940 occurred in Florida. Among males, 5.2 percent of new HIV cases were attributed to IDU or male-to-male contact and IDU. 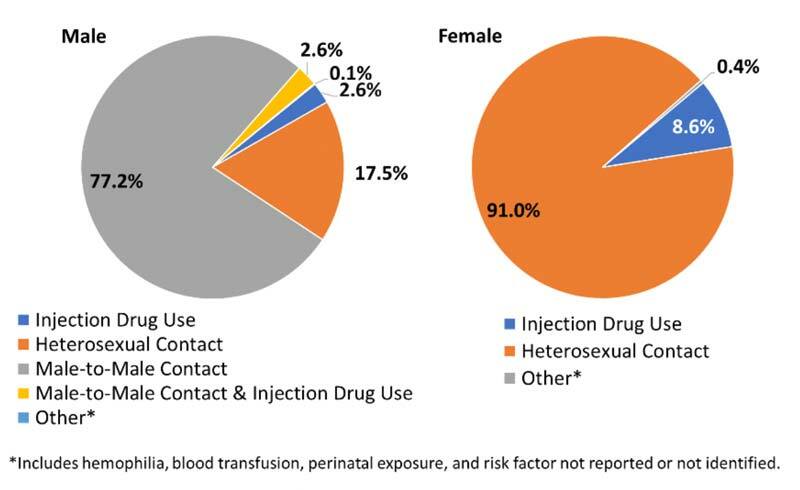 Among females, 8.6 percent of new HIV cases were attributed to IDU (Figure 4)(AIDSVu). State Prevalence: In 2015, an estimated 106,585 persons were living with a diagnosed HIV infection in Florida—a rate of 615 cases per 100,000 persons. Of those, 12.2 percent of male cases were attributed to IDU or male-to-male contact and IDU. Among females, 13.3 percent were living with HIV attributed to IDU (AIDSVu). State Incidence: There were approximately 236 new cases of acute HCV (1.1 per 100,000 persons) reported in Florida in 2016 (CDC). State Prevalence: In Florida, there are an estimated 153,300 persons living with Hepatitis C (2013-2016 annual average), a rate of 970 cases per 100,000 persons (HepVu).